Today our explorations take us to the historic Wharton Iron Furnace, one of the nicest restoration projects I have seen with a 19th century iron furnace. This furnace's dates of operation show it running from 1839-1873, with it running regularly from 1839-1850. It was reopened during the Civil War to produce cannonballs. It is 33 feet wide, 31 feet deep, and 31 feet tall. It is located in what is now a part of Forbes State Forest, and is worthy of a side stop en route to the area's attractions, including Ohiopyle and Fallingwater, which are about a twenty minute drive away. The furnace, and the community effort to restore it, is extremely impressive. These old furnaces, if anything remains of them, are often piles of rocks or small foundations that have been overwhelmed with undergrowth. Some largely undisturbed, and intact, gems remain, such as Venango County's Rockland Furnace though that one is an outlier. 150 years in the elements of Pennsylvania with no maintenance will lead to almost anything crumbling away. 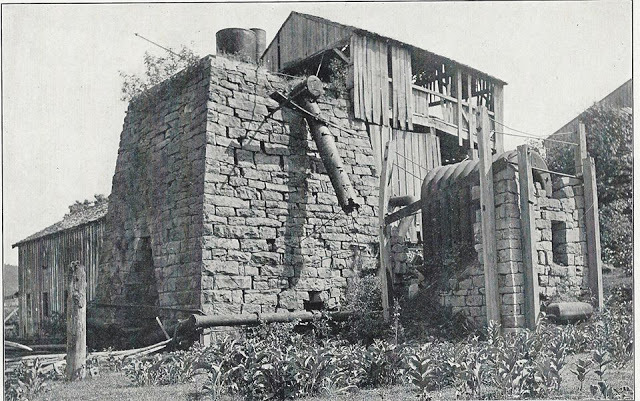 This charcoal furnace was built by Congressman Andrew Stewart. Other remnants from the furnaces more booming days can be found throughout, including these remnants from the adjacent creek. This photo shows the furnace from 1932 or earlier. I sourced it from the awesome Coal and Coke/Old Industry of Southwestern Pennsylvania page, which is one of my favorite blogs in regards to old industry in Western Pennsylvania. One of the last ingots made in this furnace. If you are in Fayette County, we highly recommend stopping and checking out this neatly restored former iron furnace.